The tool look depends on the Windows version, but the overall feel is the same. 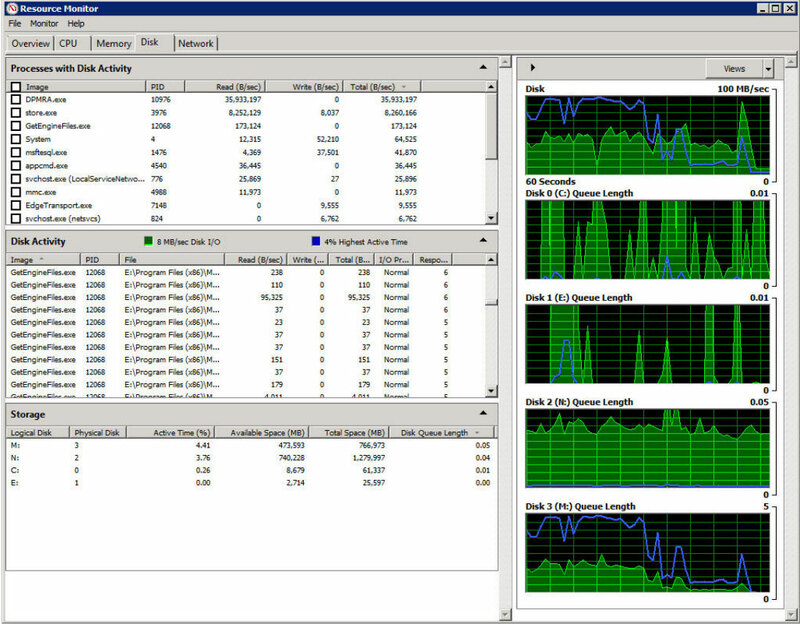 This section of the Resource Monitor window shows you a list of all of the running processes that are using disk resources. You are shown the name of the executable and a number of performance statistics. • Image. Process executable file name. This is the name of the process that is actively using the disk. • PID. The ID number associated with the process. This is useful if you want to use other utilities to manage processes, or if you want to easily match up processes with Task Manager. • Read (B/sec). The average number of bytes read per second by the process in the past minute. • Write (B/sec). The average number of bytes written per second by the process in the past minute. • Total (B/sec). The average number of bytes accessed per second in the past minute. The information you are provided in this section is not particularly useful when troubleshooting except to show you which processes are consuming the most disk performance resources. In Figure A, you can see that the process named DPMRA.exe is doing a ton of reads from the disk. This section of the Resource Monitor window provides you with more useful troubleshooting information. In particular, the response time metric is probably the most useful metric of the bunch, as it is directly observable without having to really understand the underlying storage configuration. To the right side of this section label, you will see two quick-glance information boxes. The green box shows you the current disk I/O (i.e., the amount of data that is being transferred right now), and the blue box lists the highest amount of active time for the disks in the system. • File. The name of the file that is being used by the active process. You will notice that you're pointed to the full path so it's easy to find the file. • I/O Priority. The priority of I/O transfers. • Response Time (ms). Disk response time in milliseconds. For this metric, a lower number is definitely better. • Logical Disk. The drive letter associated with a disk. • Active Time (%). This shows the percentage of time that the disk is not idle and is actively serving requests. If a disk is constantly running at very, very high levels (say, more than 80%), it may point to a storage-related bottleneck. • Available Space (MB). How much disk space is available on the volume? • Total Space (MB). What is the total size of the volume? • Disk Queue Length. Average disk queue length. The queue length metric displays the number of outstanding requests (read and write) at any given time. A high number can indicate that there are not enough disk spindles to service the needs of the application or that the existing storage is too slow to keep up with requests.